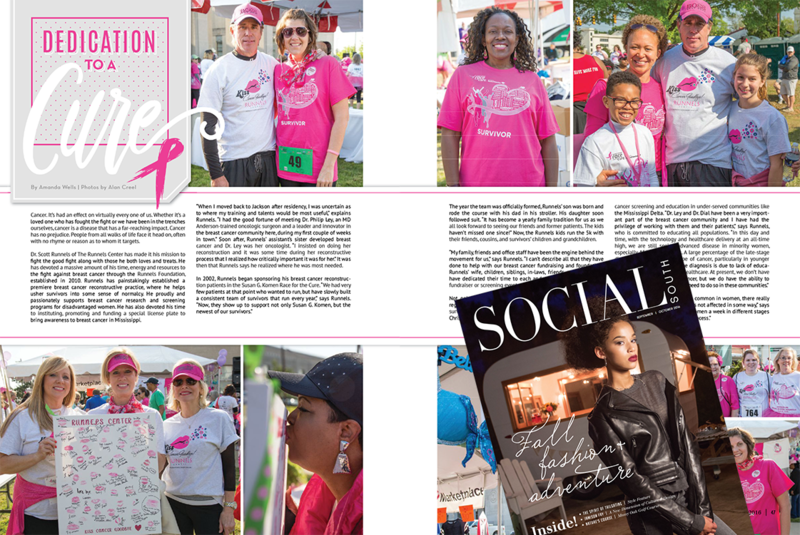 SocialSouth: "Dedication To A Cure"
Cancer. It's had an effect on virtually every one of us. Whether it's a loved one who has fought the fight or we have been in the trenches ourselves, cancer is a disease that has far-reaching impact. Cancer has no prejudice. People from all walks of life face it head on, often with no rhyme or reason as to whom it targets. Dr. Scott Runnels of The Runnels Center has made it his mission to fight the good fight along with those he both loves and treats. He has devoted a massive amount of his time, energy and resources to the fight against breast cancer through the Runnels Foundation, established in 2010. Runnels has painstakingly established a premiere breast cancer reconstructive practice, where he helps usher survivors into some sense of normalcy. He proudly and passionately supports breast cancer research and screening programs for disadvantaged women. He has also devoted his time to instituting, promoting and funding a special license plate to bring awareness to breast cancer in Mississippi. "When I moved back to Jackson after residency, I was uncertain as to where my training and talents would be most useful," explains Runnels. "I had the good fortune of meeting Dr. Philip Ley, an MD Anderson-trained oncologic surgeon and a leader and innovator in the breast cancer community here, during my first couple of weeks in town." Soon after, Runnels' assistant's sister developed breast cancer and Dr. Ley was her oncologist. "I insisted on doing her reconstruction and it was some time during her reconstructive process that I realized how critically important it was for her." It was then that Runnels says he realized where he was most needed. 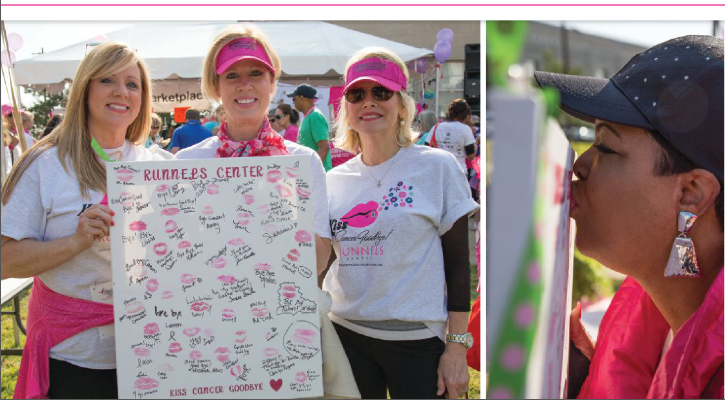 In 2002, Runnels began sponsoring his breast cancer reconstruction patients in the Susan G. Komen Race for the Cure. "We have very few patients at that point who wanted to run, but have slowly built a consistent team of survivors that run every year," says Runnels. "Now, they show up to support not only Susan G. Komen, but the newest of our survivors." The year the team was officially formed, Runnels' son was born and rode the course with his dad in his stroller. His daughter soon followed suit. "It has become a yearly family tradition for us as we all look forward to seeing our friends and former patients. The kids haven't missed one since!" Now, the Runnels kids run the 5k with their friends, cousins, and survivors' children and grandchildren. "My family, friends and office staff have been the engine behind the movement for us," says Runnels. "I can't describe all that they have done to help with our breast cancer fundraising and foundation." Runnels' wife, children, siblings, in-laws, friends, and office staff have dedicated their time to each and every breast cancer walk, fundraiser or screening event. 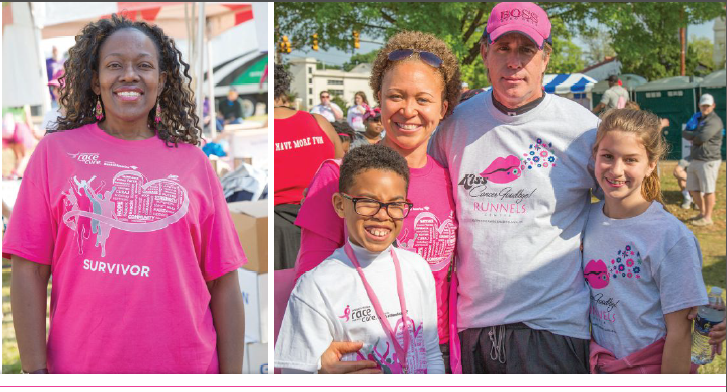 Not only is Dr. Runnels involved in Race for the Cure, but he regularly speaks to groups of women on the topics of breast cancer surveillance and reconstruction. In conjunction with Dr. Ley and Dr. Christina Dial, he has developed a foundation promoting breast cancer screening and education in under-served communities like the Mississippi Delta. "Dr. Ley and Dr. Dial have been a very important part of the breast cancer community and I have had the privilege of working with them and their patients," says Runnels, who is committed to educating all populations. "In this day and time, with the technology and healthcare delivery at an all-time high, we are still seeing advanced disease in minority women, especially African Americans. A large percentage of the late-stage diagnosis id due to lack of education, resources and access to healthcare. At present, we don't have the ability to prevent breast cancer, but we don't have the ability to identify it earlier and desperately need to do so in these communities." "The face that breast cancer is so common in women, there really isn't anyone who breast cancer has not affected in some way," says Runnels. "For me, I see 10 to 20 women a week in different stages of cancer, life and reconstructive process." Reposted editorial article from SocialSouthmag.com. Used with permission.